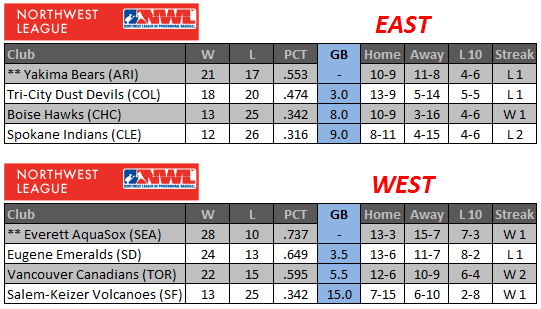 NWL Playoff Procedure: For a full explanation, go here, it’s long. Here are some of the more important details, the object is to win your division, the season “starts over” after the first half. All positional rankings are based on winning percentage. First half winners will have 7 days (Monday, July 30) to decide if they would like to host game 1 or games 2 and 3. If one team wins both the first and second half of the season then the team with the next best winning percentage for the entire season will get into the playoffs. If there is a tie for the next best winning percentage then the second half tiebreakers come into play. That was a mouth full, before we take a look at the second half standings let’s take a look at how the first half-finished. Not a very good first half for Boise as they really struggled on the road going a dreadful 3-16. A shame really, considering first place was only four games above five hundred, but the second half has been much better thanks to some key additions, and a few guys turning it on. Well, that looks much better doesn’t it? The Hawks have completely turned it around in the second half, especially on the road. Boise is 6-2 on the road in the second, they have doubled the amount of wins they had on the road in the first half in just under half the games. Daniel Vogelbach has played a huge role in the resurgence, but it started before then as this team has finally found an identity. Tomorrow they will get a huge boost as 2012 1st round pick (6th overall) Albert Almora will be joining the team from Arizona. That should be everything the Hawks need to finish strong and make some noise in the playoffs. It’s August 13th, do you know where your favorite Cubs minor league team is in the standings? Do you know if they will make the playoffs? The minor league baseball season is winding down, so what better time than now to find out where each team stands in their respective playoff races. First up, the AZL Cubs. 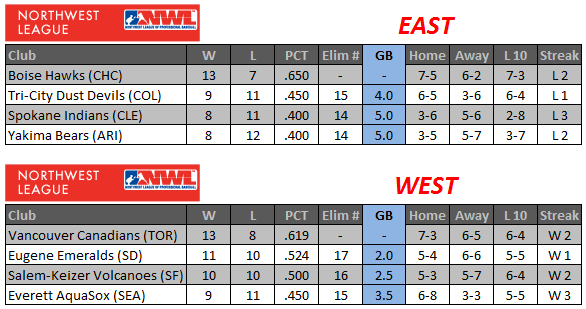 It’s a dog fight to the finish with the AZL Athletics to see who will capture the East Division crown. Luckily for the Cubs there is a wild card in play, and at worst it looks like the Cubs will lock that up if they can’t get the division. 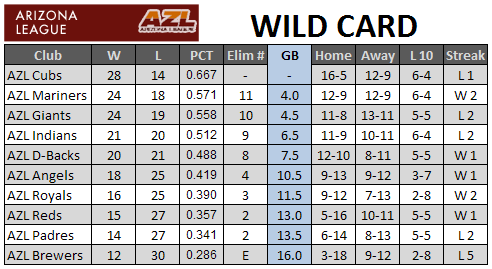 It’s been a tremendous season for the AZL Cubs, and they look like they are well on their way to the playoffs. However, because it has been such a good season, a lot of the talent that has gotten the Cubs to where they are is being moved up the pipeline (Soler, Vogelbach). That is a good thing, a really good thing, it will be up to the guys who remain in Arizona to get the job done and I think they will.